From Saturday 4 May 2019 until Sunday 30 June 2019: Enjoy 10 % off! 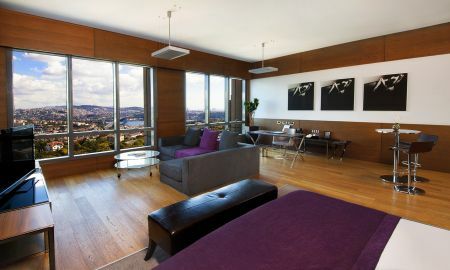 The first Art-Tech hotel in Turkey, Point Hotel Barbaros boasts an exciting array of artworks, including unique sculptures, installations, video art pieces, paintings and photographs, around its inspiring premises and in every guest room. Showcasing a breathtaking panoramic view of Istanbul and international gourmet flavours prepared by award-winning chefs, The View Point Restaurant is the perfect place to meet for business or pleasure. Ocean Restaurant serves delectable dishes, while the Piola restaurant chain promises delicious Italian cuisine. 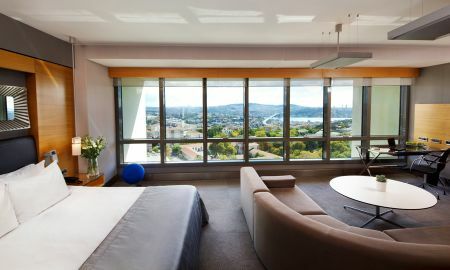 Point Hotel Barbaros features 2 bars, After 6 Lobby Bar and Lounge 34, where guests can unwind over indulgent cocktails. Point Sports Center offers an indoor swimming pool, Jacuzzi, Turkish bath, sauna and steam room, as well as relaxing spa services. Guests are also in the ideal location to visit The Game, a one-of-a-kind digital entertainment centre sponsored by Microsoft, Sony & Nintendo, where 300 people can play at the same time. Conveniently located in the heart of the business district, Point Hotel Barbaros is within walking distance of most of the local and international corporations and bank headquarters, as well as Europe’s largest shopping mall, Cevahir. The nearest coastal town of Beşiktaş is 4 kilometres away, while the Old City where the Hagia Sophia, Blue Mosque and Grand Bazaar are found is 8 kilometres away. Point Hotel Barbaros is just a stone's throw away from Gayrettepe Metro Station and countless other public transport links to the rest of the city and 30 kilometres away from Atatürk Airport.